Cost: $15 (free if cost is any barrier). If you can afford the fee, please bring cash or a cheque payable to SK Conference. Lunch included. All welcome! PDF poster: please share widely. Medical Assistance in Dying (M.A.I.D.) is a legal right in Canada. This workshop will provide an opportunity for education, exploration, and theological/spiritual reflection of the complex issues generated by this new truth in the landscape of Canadian health care. Our morning will include: Plenary and small group discussions; Understanding what M.A.I.D is and is not, and basic protocols related to it; Rural perspectives: Debbie Bathgate, RNP; Reflections/ conversations from Stakeholders’ points of view; Faith/spiritual questions that arise. 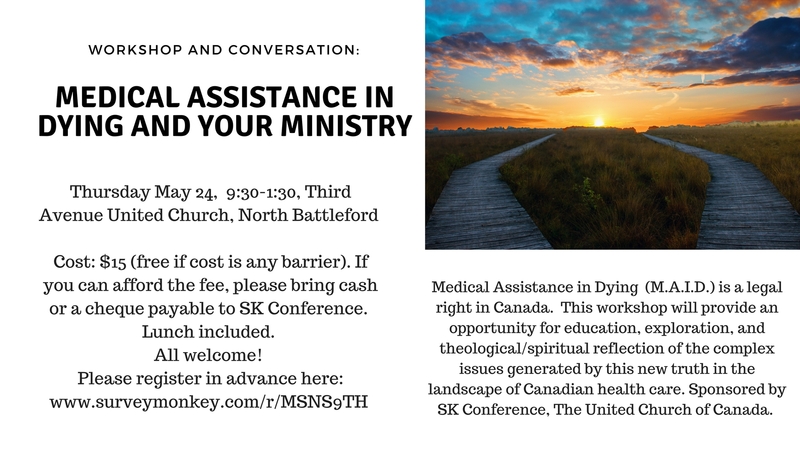 This workshop is offered by a group within SK Conference, The United Church of Canada, that includes lay people and ministry personnel who are chaplains, ethicists, and pastoral ministers. All welcome! Bring your questions, struggles, ideas, and your respect for diverse opinions. This entry was posted in Faith Formation, Uncategorized by juliegrahamskconf. Bookmark the permalink.